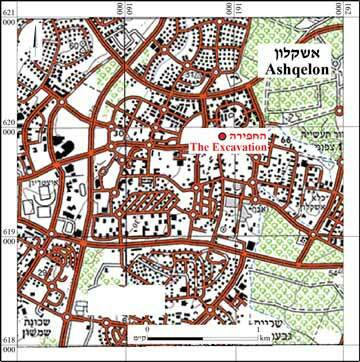 In March 2013 and April 2014, two excavation seasons were conducted south of the Great Mosque in the Migdal neighborhood of Ashqelon (Permit Nos. A-6750, A-7075; map ref. 16080-5/61975-81; Fig. 1), which today serves as a museum and art gallery (the Khan). The first season was carried out for conservation purposes, while the second season was conducted prior to the construction of restrooms. The excavation, undertaken on behalf of the Israel Antiquities Authority and financed by the Ashqelon Economic Corporation, was directed by I. Peretz (photography), with the assistance of Y. El-ʽAmor and R. Abu Halaf (administration), M. Kunin, S. Gal, R. Mishayev and R. Liran (surveying and drafting), N. Zak and E. Belashov (plans), I. Lidsky-Reznikov (pottery drawing), Y. Gorin-Rosen (glass), D.T. Ariel and I. Baidoun (numismatics) and laborers from Ashqelon and Abu Kaf. The Great Mosque of al-Majdal, occupied in the War of Independence, was briefly described by several travelers, including V. Guérin, who noted that the mosque was built of roughly hewn stones, the courtyard in front of it was paved with marble tiles and several marble columns were lying on the ground (Guérin 1869:130). As part of a conservation project carried out in recent years, the plan of the mosque, which includes three phases from its beginning to the present, was published (Sasson 2013); the two early phases date to the Mamluk period and the late phase dates to the Ottoman period. In the past, a painted tomb dating to the Late Roman period and building remains and installations from the Byzantine, Early Islamic, Mamluk and Ottoman periods and the modern era were exposed in the Migdal neighborhood (Kogan-Zehavi 1999; Haimi 2009; Nahshoni 2009; Peretz 2014; Permit No. A-7019). Two areas (A and B; Fig. 2) were opened during the excavations: Area A along the southern side of the mosque and Area B, inside the mosque’s courtyard. Seven squares were opened in Area A (c. 126 sq m), revealing four strata (IV–I) dating to the Mamluk and Ottoman periods and the modern era and a fragment of a glass window from the beginning of the Early Islamic period. 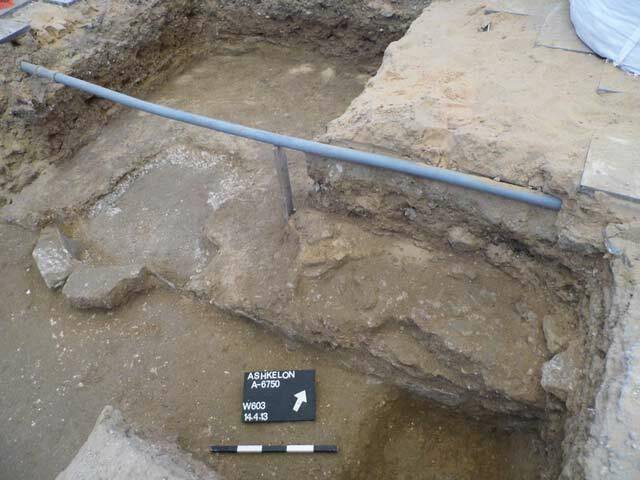 Three small excavation squares opened in Area B in the mosque’s courtyard exposed two strata from the Ottoman period (III, II) as well as a stratum ascribed to the modern era. Ceramic artifacts dating to the Byzantine period were also discovered in Area B.
Stratum IV—The Mamluk Period (Fig. 3). 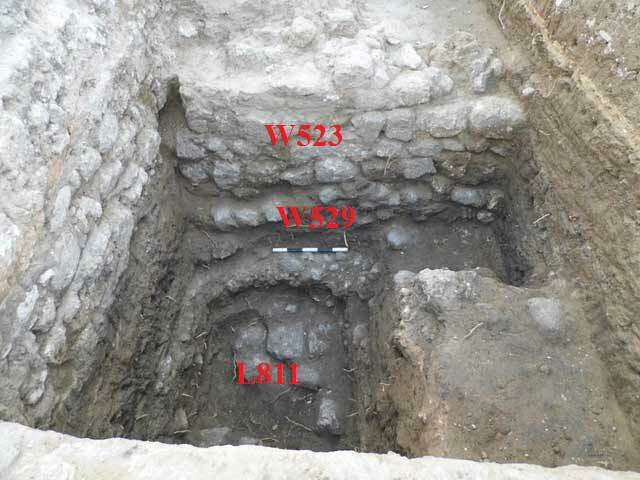 An accumulation of ash and stones (L809) was discovered in the southeastern square of the area, below large stones and grayish sandy soil (L811; Fig. 4). Virgin soil was exposed beneath these remains. A jar rim (Fig. 5:5) and a decorated body fragment (Fig. 5:6), probably of a krater, both dating to the Mamluk period, were found. Stratum III—The Ottoman Period. Walls and floors that did not form a clear architectural plan were exposed in the south of the area. Three phases (A–C) were identified. 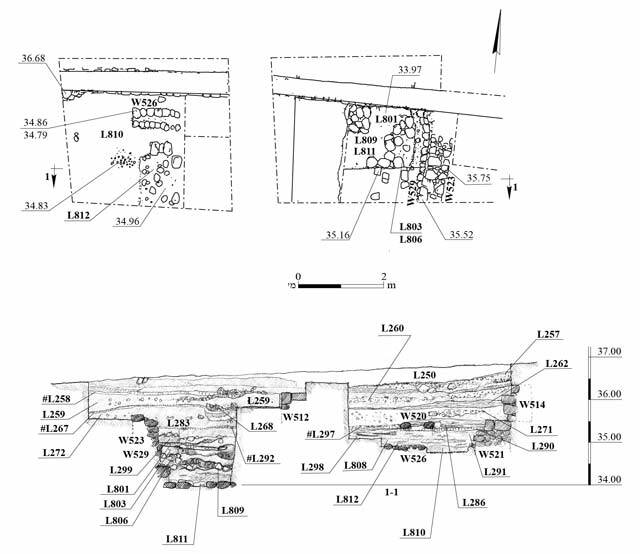 In Phase A, the early phase, a broad wall (W529; width 0.8 m; see Fig. 3) that probably served as the foundation of a wall (W523) constructed above it was exposed in the southeastern square above Stratum IV. Layers of ash, earth, reddish clay and kurkar (L803, L806) on which a kurkar floor (L801) was placed were revealed next to W523 and W529. An Ottoman manghir struck at the Misr el-Mah (1574–1617 CE; rousa mint IAA 154939) was found in L806, below the floor, thus providing a terminus post quem for the construction of the floor. A fragment of a clay tobacco pipe from the nineteenth century CE (below; Fig. 6:41) discovered on a kurkar floor (L801), thereby dating the end of the use of this floor and the earliest date of the floor from the next phase. Floor 801 was covered with ash mixed with soil. A section of a narrow wall (W526; width 0.4 m) preserved to a height of a single course was exposed in the southwestern square. West and south of the wall were stone surfaces overlain with an accumulation of ash, soil, clay and small stones (L810) and an accumulation of clay mixed with brown sand (L812). Two adjoining walls (W524, W525; Fig. 7) were exposed in the center of the area. Wall 524 was built of two rows of roughly hewn stones of various sizes and a core of mortar, soil and small stones. Only the southern face of W525, built of roughly hewn stones and preserved to a height of two courses, was exposed. A kurkar floor (L294) built on a bedding of small stones and clay fill (L295, L807) abutted W524 and W525. The finds from Phase A included fragments of pottery vessels dating to the Ottoman period, mainly Black Gaza Ware, including bowl bases (Fig. 6:1), zavdiya-type bowls (Fig. 6:2), masharat-type bowls (Fig. 6:10–12) and ‘arabe-type kraters (Fig. 6:9), a krater (Fig. 6:13), handmade cooking pots (Fig. 6:19, 20), a jar similar to jars from the Mamluk period (Fig. 6:23), a large store jar (zir?) (Fig. 6:24), jars (jarot; Fig. 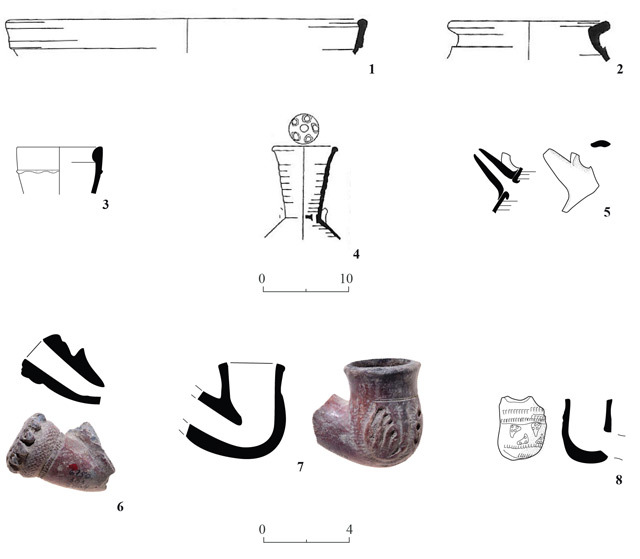 6:25–27), a bottle or flask (sharabe; Fig. 6:37), a flask (Fig. 6:39) and two clay tobacco pipes (L801; Fig. 6:41, 42), at least one (Fig. 6:41) dating to the nineteenth century CE (Dekkel 2008:148–149, Fig. 4.12:67). Phase B (Fig. 7). Wall 523 continued to be used; the kurkar floor (L292) in the room was raised with ash and soil fill (L299), placed above Floor 801. Clay and stones accumulated (L283) on Floor 292 after it was no longer used. Another wall (W521) constructed of roughly hewn medium and large-sized stones and preserved to a height of 1.2 m, was exposed west of W523 and Floor 292; W521 may have been a pillar that supported an arch. North of this wall was a round stone heap (W522). 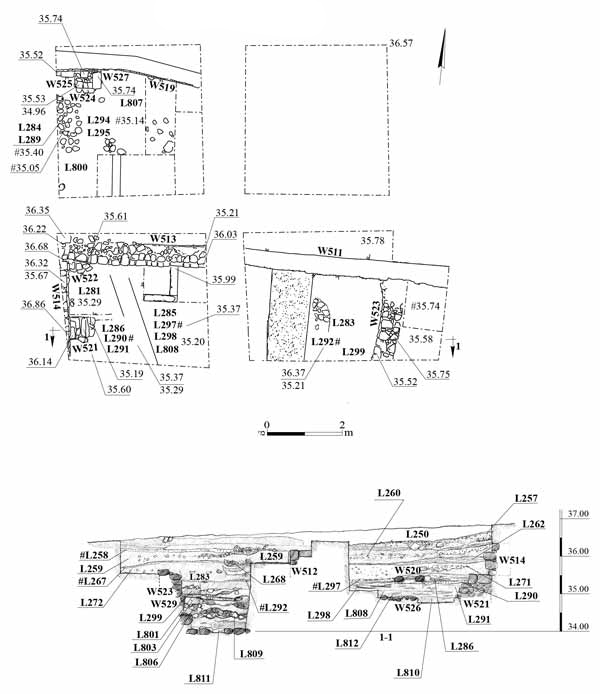 Apparently, W521 was related to the kurkar floor (L290, L297) set above the layers of fill consisting of ash mixed with soil, a few small stones (L291), brown clay (L298) and red mortar mixed with ash and earth (L808); these fills were deposited directly on top of the remains of Phase A. Above the kurkar floor (L290 and L297) was a level of soil, ash and brown clay (L285, L286). Floor 294 of Phase A, adjacent to W524 and W525, was covered with tamped earth mixed with ash, which served as a floor (L289). Floor 289 was covered with soil mixed with ash and small stones (L284). 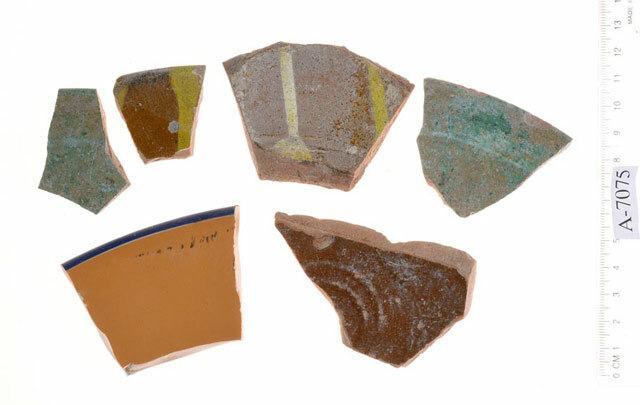 Pottery sherds from Phase B dated to the Ottoman period, and included a fragment of a glazed bowl (Fig. 6:3), imported slipped and glazed bowls (Fig. 6:4–6), a base of a bowl (Fig. 6:7), Black Gaza Ware kraters (Fig. 6:14, 15), a handmade cooking pot (Fig. 6:21), a Black Gaza Ware cooking pot (Fig. 6:22), a jar similar to the jars from the Mamluk period (Fig. 6:28), large Black Gaza Ware jars, including a zir or ‘asliyah (Fig. 6:29), a vessel used for milk known as a makhaba (Fig. 6:30), jarot (Fig. 6:31–33) and flasks (Fig. 6:38, 40). Phase C. A channel (L520; Figs. 8, 9) built of two rows of variously-sized fieldstones was in the southwestern square, above Floor 290. The channel was discovered filled with soil (L805). Fills composed of soil, ash, red mortar, brown sand and several stones (L276, L278, L280) were exposed west of the channel. In the channel and fills to the channel’s west were fragments of Ottoman-period pottery vessels, including a small Black Gaza Ware bowl (Fig. 6:8), a deep zavdiya-type bowl (not drawn), kraters (‘arabe and keyur? ; Figs. 6:16–18), a zir-type jar(?) (Fig. 6:34), a jar (Fig. 6:35), jars like the Black Gaza Ware Jarah Type 1 (Fig. 6:36), occurring until the beginning of the twentieth century (Israel 2006:93), a tobacco pipe (Fig. 6:43) from the second half of the nineteenth century CE (Dekkel 2008:152–153, Fig. 4.14, 78) and a hookah (Fig. 6:44). The rim of a similar hookah was found in Yafo, where it was dated to the nineteenth century (de Vincenz 2015). 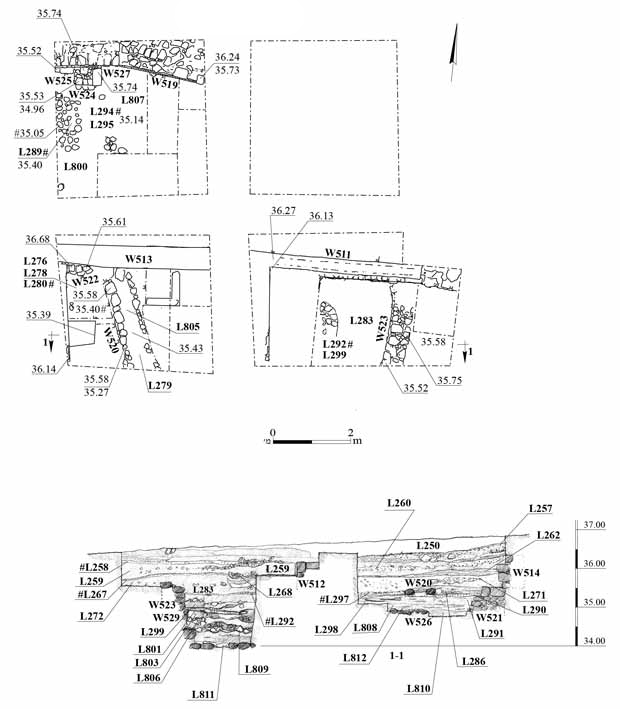 A partition wall (W509) and the foundations of the southern walls of the mosque (W501, W502) were exposed in the northern part of the area (Fig. 10), southwest of the mosque’s mihrab. Walls 501 (height 7.8 m) and 502 (width 0.7 m, height c. 2.4 m) were built of medium and large-sized ashlars; the southern face of Wall 501 was treated with dark gray plaster. Soil fill devoid of finds (L219–L221) was exposed north of W509. Wall 509 and the fills associated with it were sealed by a floor and the fills of Stratum II. Stratum II—The Late Ottoman and British Mandate Periods (Figs. 11, 12). Five rooms of three buildings (1–3), a wall (W510) of another building (4) and a paved surface (5) were partially exposed. The buildings were paved with various kinds of floors and some of the rooms displayed changes. Aerial photographs from 1918 (Fig. 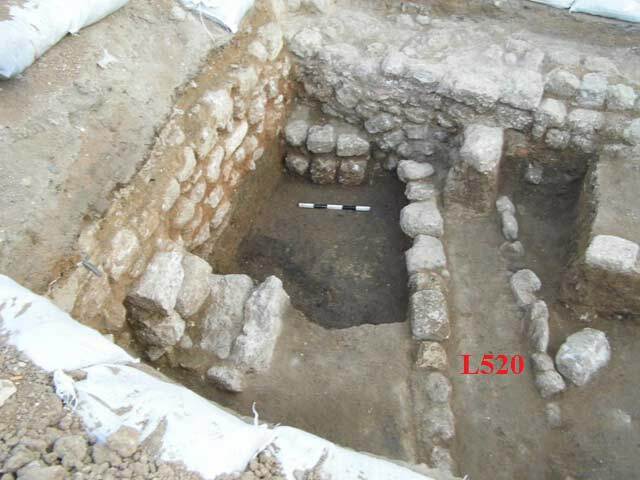 13) and 1947 (Sasson 2013) show buildings close to the southern wall of the mosque, including a small plaza, which are consistent with the finds uncovered in the excavation. A single room (L205) of Building 1 was exposed next to the southwestern corner of the mosque. The walls delineating the room to the north (W506), east (W503) and south (W515, width 0.6 m, preserved height 7 m) were discovered. These walls were constructed of two rows of medium and large-sized stones, with a core of small stones, and were treated with gray (W503) and white (W506) plaster. The floor of Room 205 was made of cement tiles (0.25 × 0.25 m) painted red, gray, white and black arranged diagonally and enclosed within a frame of two rows of black tiles and a few marble items in secondary use. A similar pavement was exposed in the courtyard of the mosque (Area B, below). Stone collapse and modern debris were found above the floor. Two rooms (L209, L212) of Building 2 were exposed to the east of Room 205 and slightly south of the mosque’s mihrab. 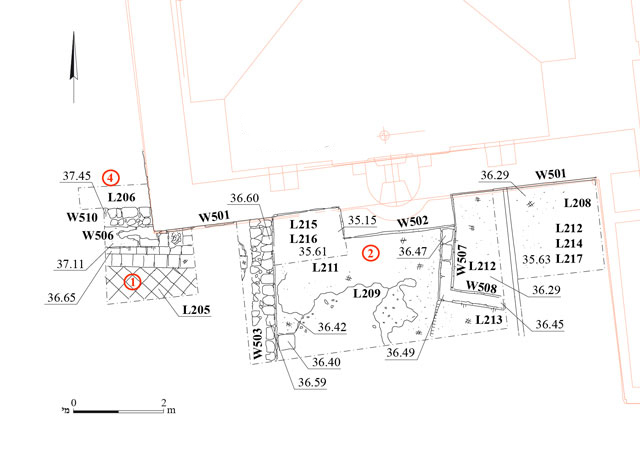 Room 209’s plan was irregular and most of the walls delineating the room were exposed (W501, W502, W503, W507, W508, W515, W519). Walls 507, 508 and 519 (width 0.20–0.35 m) were built of a single row of roughly hewn stones bonded with gray mortar. Sections of two floors were discovered in Room 209, higher L209 and lower L213; an accumulation of modern debris was found above them. Floor 209 was made of red plaster and was founded on a bedding of kurkar and soil fill (L211, L215 and L216). Remains of Stratum III were discovered below these fills. The southwestern corner of Room 212 of Building 2 had a floor of light gray plaster, lower than Floor 209 but higher than Floor 213. Beneath Floor 212 (L214, L217) were soil fill and fragments of pottery vessels. 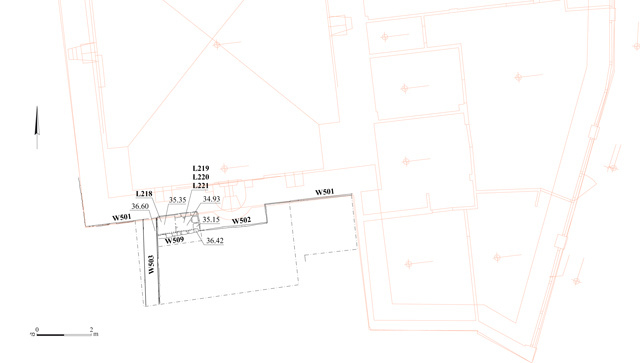 Two adjacent rooms of Building 3, separated by a common wall (W512), were exposed south of Open Area 5. The northern (W513) and western (W514) walls in the western room and the northern wall (W511) of the eastern room were exposed. The walls of the two rooms were built of roughly hewn, mostly medium-sized stones and fieldstones bonded with red-brown mortar and small stones. A floor (L262) made of brown tamped soil and ash was found in the western room. Floor 262 abutted an installation (L802) enclosed by two walls (W517, W518) constructed of a single row of partially worked kurkar stones. 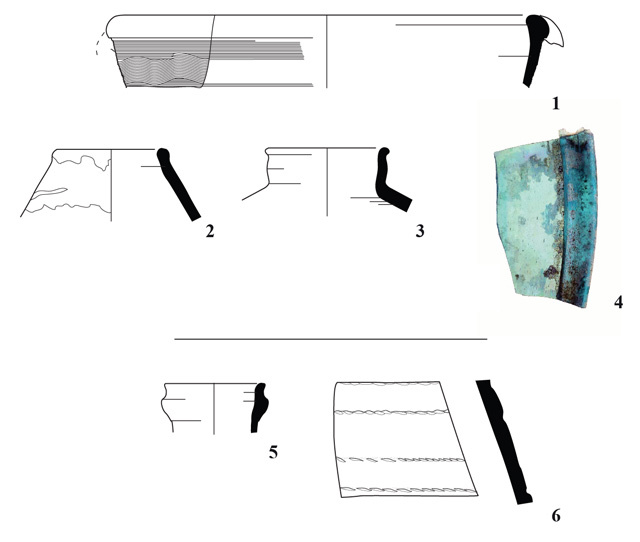 Floor 262 was laid on a level of ash (L271, L274) in the western part of which a cooking pot was found (Fig. 14). Brown soil fill (L268) and an overlying floor bedding (L267) of tamped kurkar and small pieces of charcoal were found in the eastern room. The negatives of floor tiles were discerned above the floor bedding. Just north of Building 1 was W510 of Building 4, which extended west of the mosque. A floor consisting of a thin level of red-orange mortar (L206) was exposed north of W510. 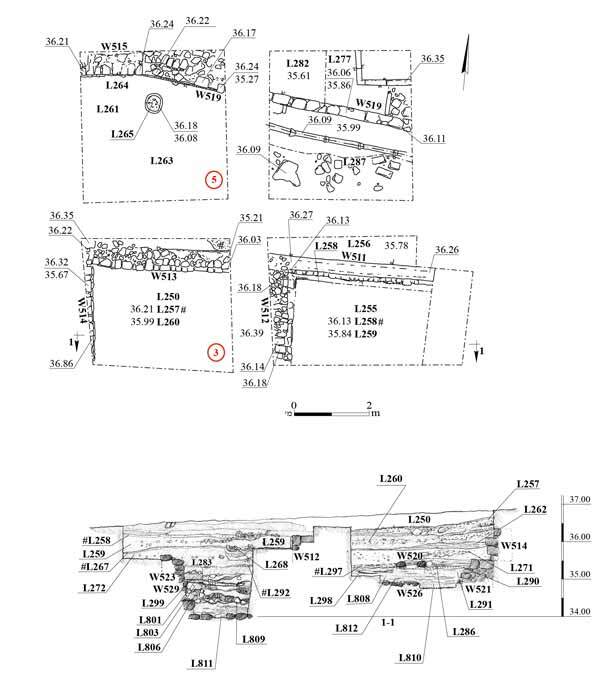 Part of an open area (c. 22 sq m) paved with gray plaster (L266) placed on black clay fill and small stones (L269) was exposed south of Buildings 1 and 2. Floor 266 was mostly destroyed by the activity in Stratum I. On the western side of the open area was a wall (W516) built of a single row of roughly hewn stones, including a threshold in secondary use. This wall was slightly lower than the plaster floor (266), and probably separated the plaster floor from the western part of the open area, where the floor was not discerned in the section. The finds from Stratum II included bowls (Fig. 15:1–3), kraters (Fig. 15:4–7), Black Gaza tanjara-type cooking pots (Fig. 15:8, 9; Israel 2006:176–179, Fig. 167), a jar (Fig. 15:10), a bottle or saqiye jar (Fig. 15:11) and tobacco pipes (Fig. 15:12–16) from the nineteenth century CE (Dekkel 2008:152–153, Fig. 4.14:78). Stratum I—The British Mandate and the State of Israel (Fig. 16). A reinforced concrete beam (width 0.4 m), probably intended for a second floor, was installed on W511 of Building 3. Remains of gray cement, possibly of a similar concrete beam, were also discovered on W513 of this building. Two new floors from this phase were found in Building 3. A floor consisting of broken cement tiles, stones, red plaster and brown clay (L258), placed on a fill of clay and tile fragments (L259), was discovered in the eastern room of the building. A coin from 1935, which dates the stratum, was found in the floor foundation. A cement floor (L257) set on a fill composed of brown clay, red clay and stones (L260) in the western room of Building 3 only abutted W513. From 1965 till 1980, use of the buildings for residential purposes gradually declined (Sasson 2013:45–46). North of W519, a curbstone was constructed in relation to the new Ashqelon Foundation building, and a concrete drainage pipe and a small pool (L265; diam. c. 0.9 m) were installed in the open area of Stratum II. The pool and the pipe were covered with beach sand (L264) in which a one-agora coin from the late 1960s and a coin from the Ottoman period (1820–1880) were discovered. A refuse pit (L287) dug at the time of the pipe’s installation ultimately negated the use of the buildings situated next to the mosque. Discovered in the fills in this stratum were fragments of porcelain bowls (Fig. 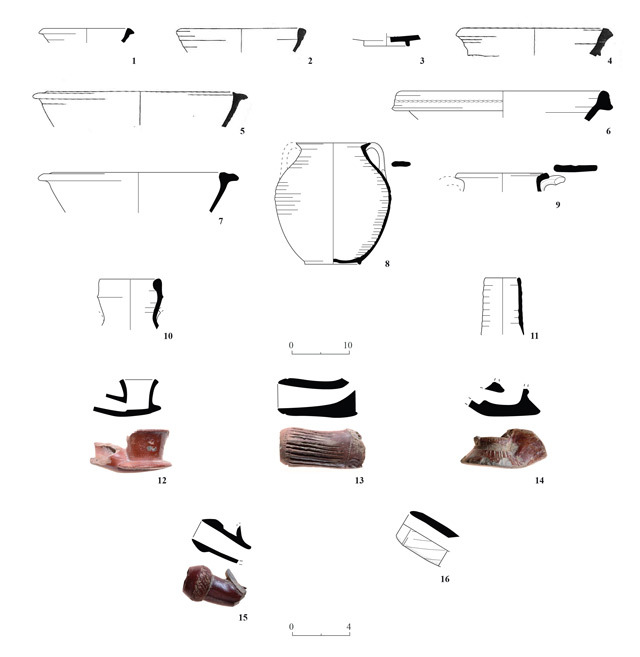 17:1–4) and several fragments of imported pottery vessels (Fig. 18). Other artifacts from Stratum II (L220) included a single fragment of a round glass window from the beginning of the Early Islamic period (Fig. 5:4). The edge of the window was folded and tapped down, and its wall rather thin and the glass was turquoise and covered with golden weathering. Colored windows of this type appear in the Umayyad period. The window presumably came from a public building located nearby. This is the only ancient artifact discovered in Area A.
Stratum III—The Ottoman Period. Remains of a wall (W603) with a small niche in it were exposed in the square in the center of the courtyard (Fig. 19:1). The niche (Fig. 20) is located along the same axis as the opening of the prayer hall in the mosque and the mihrab. A pair of medium-sized stones, bonded with gray cement and charcoal, were preserved of the niche. The southern side of the wall and the niche were treated with gray cement mixed with charcoal while the northern, inner face of the wall and the niche was coated with yellowish-white plaster. The purpose of this niche is unclear. It may have been a mihrab or a fountain or water installation for ablution before prayer, like the courtyards of other mosques (Rauchberger and Bouchenino 2013). The disturbed remains of a floor (L323), apparently made of kurkar, were discovered just south of the niche. Similar floor remains were found elsewhere in the square (L308, L311, L319). Marble fragments were uncovered during the excavation of the square. It is possible that the remains of the wall with the niche and the floor belong to the early phase of the mosque’s courtyard, from the Ottoman period. Stratum II—The Late Ottoman Period. Part of the foundation of the western pillar of a southern wing of rooms enclosing the courtyard (W602) was exposed in the southwestern square in the courtyard (Fig. 19:2). The pillar’s foundation was built of large kurkar stones (depth 1.5 m) set into soft red-brown kurkar soil (L310). Overlying the kurkar soil was a fill of brown soil (L307) covered with a tamped earthen fill (L306) on which a floor (L306) was set. The floor was made of diagonally arranged black and white cement tiles (0.2 × 0.2 m), like the floor in Room 205 of Building 1 in Area A (Stratum II). The remains discovered in this square were disturbed when modern pipes were installed in the area. The northwestern pillar of the courtyard (W605) and the courtyard’s western wall (W604) were exposed in the square opening in the northwest of the courtyard (Fig. 19:3). Both the pillar and the wall were constructed of carefully hewn stones and founded on small fieldstones and brown soil; the eastern face of W604 was white-plastered. A fill of brown soil and small stones (L321) adjoined the foundations of the pillar and the wall. Above Fill 321 were layers of leveled fill consisting of gray soil, sometimes mixed with chunks of cement and small stones, abutting the pillar and the wall (L316, L317, L320). These fills were overlain with a foundation of gray cement and beach sand, above it was the floor of the mosque’s courtyard, paved with cement tiles (L305) like those discovered in the square in the southwest of the courtyard. Floor 305 was not preserved in the trial square opened in the center of the courtyard. 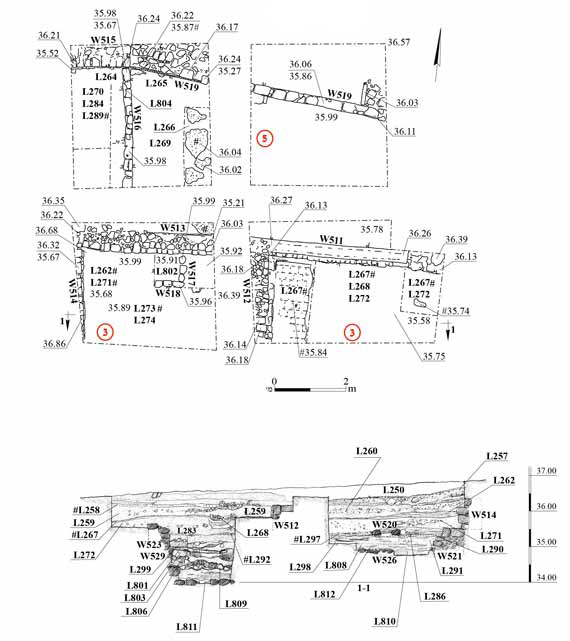 It seems that the remains of Stratum II belonged to two phases: an early phase to which Pillars 602 and 605 and W604 are ascribed and a late phase to which Tile Floor 305 belonged. A few fragments of Black Gaza Ware vessels from the end of the Ottoman period, including kraters (Fig. 21:1, 2), jars (Fig. 21:3–5) and tobacco pipes (Fig. 21:6–8), were discovered in the three trial squares. Stratum I—The Present. From the mid-1980s on, renovation work was carried out in the mosque’s courtyard. This included, among other things, laying sand fill above Late Ottoman-period Floor 305, which served as the foundation for a new marble floor (L300). 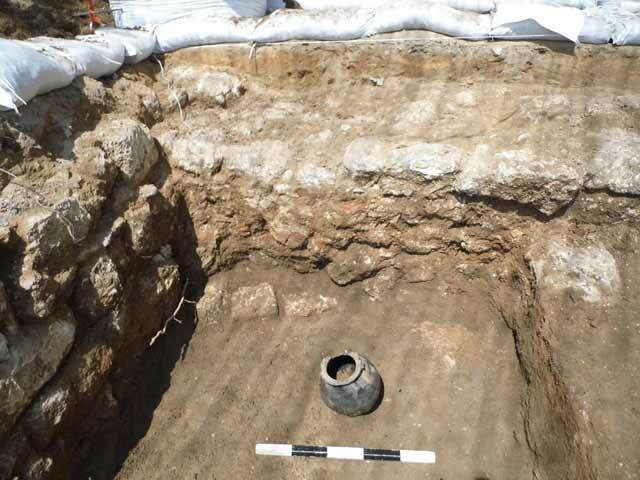 Fragments of pottery vessels dating to the Byzantine period and the beginning of the Early Islamic period were found in the layers of fill in Area B (L307, L308, L310, L320, L321); these included a deep krater (Fig. 5:1), a Gaza jar (Fig. 5:2) and a bag-shaped jar (Fig. 5:3). These finds were mixed with artifacts from the Ottoman period. These finds, together with numerous fragments of pottery vessels from the Late Roman and Byzantine periods and a marble column fragment found west of the excavation (Permit No. A-7019), may indicate that a rural settlement including a public building was located near the mosque during these periods. The earliest finds are fragments of pottery vessels from the Late Byzantine period and the beginning of the Early Islamic period, exposed in fills in the mosque’s courtyard, that probably originated in the settlement situated nearby. The finds from the Mamluk period (Stratum IV), when the mosque was constructed (based on an inscription from the year 1300 CE; Sasson 2001) were meager. The finds from the Early Ottoman period (late sixteenth–early seventeenth centuries CE) included one coin discovered in fill beneath the floor of one of the buildings from the Ottoman period (Stratum III) and above fill that is ascribed to the Mamluk period. The remains of the wall with the niche in the center of the mosque’s courtyard should probably also be attributed to this period. It is possible that the marble fragments discovered in the excavation of this square are remains of the marble pavement in the courtyard described by V. Guérin during his visit to the mosque in the second half of the nineteenth century CE (Guérin 1869:130). The niche does not appear in the photograph taken in 1947 (Sasson 2013). Apprently, this courtyard was canceled after Guérin’s visit there, possibly during the renovations of the mosque toward the end of the nineteenth–beginning of the twentieth centuries. From the 1830s on, Majdal expanded and underwent a transformation into an economic and administrative center—the district seat of the central Ottoman government (Sasson 2001). The buildings to the south may have been constructed or renewed at the same time as the renovation of the mosque. Remains of buildings and an open area (Strata III–II) from the Late Ottoman period (nineteenth–early twentieth centuries CE) were exposed just south of the mosque. It was not customary to build structures adjacent to mosques; therefore, the role of these buildings is unclear (Sasson 2013). Construction changes and additions were noted in the buildings of Stratum III (nineteenth century CE). These remains were completely negated during the construction of Stratum II. In Stratum II (late nineteenth–early twentieth centuries CE), the buildings visible in the aerial photograph taken in 1918 (Fig. 13) were constructed. At least three densely crowded buildings and an open area paved with gray cement were exposed. These were apparently used as dwellings, perhaps by the people responsible for the mosque. A reinforced concrete beam, possibly intended for a second story, was added to the southern structure in Stratum I, probably during the time of the British Mandate. Later, the floor of this structure was raised. Arabs lived in the buildings from the end of the War of Independence until 1950, after which new immigrants resided there. The buildings were abandoned between 1965 and 1980, during which some of them were demolished and a new drainage pipe was installed. Later, a building was erected for the Ashqelon Foundation near the southeastern corner of the mosque, curbstones were placed there and palm trees were planted. The finds from the two areas of Stratum I are meager, and include mainly locally produced Black Gaza Ware, several tobacco pipes, a hookah and imported pottery vessels. Guérin V. 1869. Description géographique, historique et archéologique de la Palestine: Judée. Tome Deuxiéme. Paris. P. 130. Israel Y. 2006. Black Gaza Ware from the Ottoman Period. Ph.D. diss. Ben-Gurion University of the Negev. Be’er Sheva‘ (Hebrew). Rauchberger L. and Bouchenino A. 2013. A Fountain and Other Remains from the Middle Ages in Ramla. ‘Atiqot 75:51*–70* (Hebrew; English summary, pp. 173–174). Sasson A. 2001. Development of the Ashkelon La0ndscape and Surroundings in the Late Ottoman Period. In A. Sasson, Z. Safrai and N. Sagiv eds. Ashkelon, Bride of the South: Studies in the History of Ashkelon from the Middle Ages to the End of the Twentieth Century. Tel Aviv. Pp. 104–111 (Hebrew). Sasson A. 2013. The Great Mosque (The Khan) Migdal-Ashkelon. Historical and Architectural Documentation File. Research Foundation for the Study of the Coastal Plain. Ashqelon. 3. Area A, the southern squares, Strata IV and IIIA, plan and section. 4. Area A, the southeastern square, looking east. 5. Pottery and glass fnds from the Byzantine, Early Islamic and Mamluk periods. 6. Pottery from Stratum III in Area A. 7. 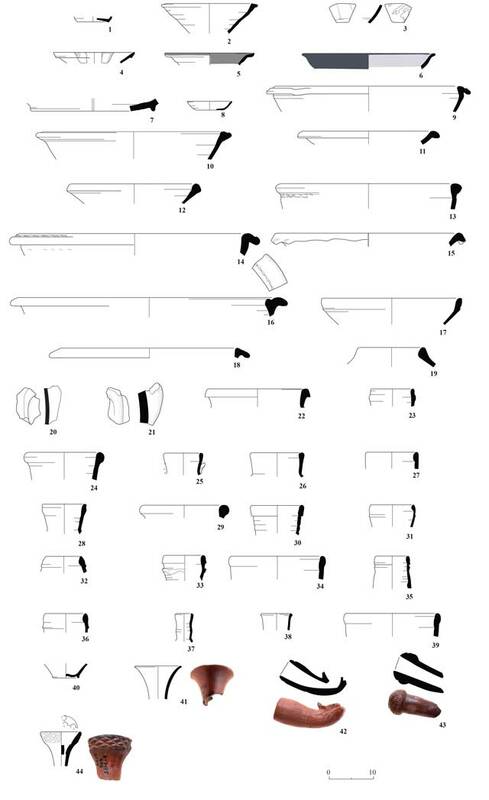 Area A, the southern part, Strata IIIA and IIIB, plan. 8. Area A, the southern part, Stratum IIIC, plan and section. 9. Area A, the southwestern square, Stratum IIIC, looking north. 10. Area A, the northern part, Stratum III, plan. 11. Area A, the northern part, Strata I and II, plan. 12. Area A, Stratum II, plan and section. 13. 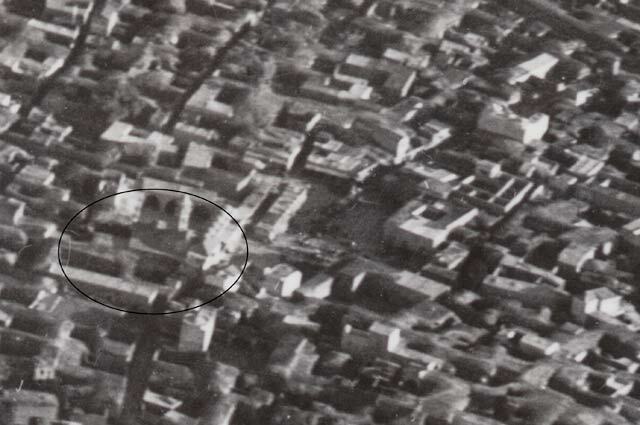 The mosque and its immediate vicinity, aerial photography from 1918. 14. Area A, Phase II, a cooking pot on an ash level (L271) in Building 3, looking north. 15. Pottery from Stratum II in Area A. 16. 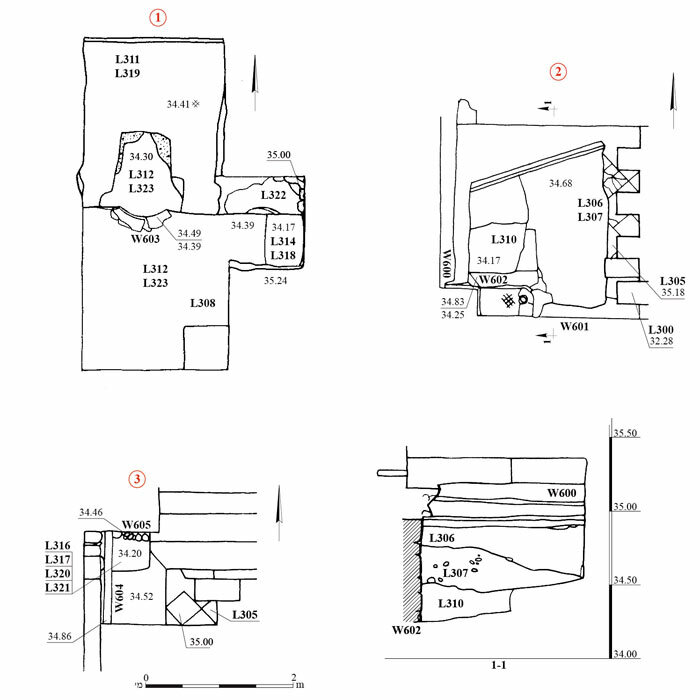 Area A, southern part, Stratum I, plan and section. 17. Pottery from Stratum I in Area A. 19. Area B, plan and section. 20. Area B, the niche in W603, looking northwest. 21. Pottery from Area B.